I’ve never actually had authentic pho. Even before my family moved to a plant-based lifestyle, I had a major aversion to any foods containing fish or beef—both key players in a flavorful pho broth. However, I am a firm believer that there is always away around food aversions, allergies, and dietary restrictions. Hence an attempt at faux pho, in the slow cooker no less. My family loves this dish because they can choose their own ingredients when assembling their meal. Since I meal plan, I know to take an extra few minutes on my meal prep day to finely chop the vegetables that we will use for serving. With the vegetables already chopped and the broth simmering in the slow cooker, all that’s left to do at dinner time is to cook the noodles. 10 minutes to a healthy, flavorful, customizable dinner? Now we’re talking. This is more method than recipe since it can be customized with any number of vegetables in the broth and also in the final product. By using the slow cooker, we’re able to infuse the broth with the rich flavor of aromatic vegetables negating the need for animal based flavorings. This is also the perfect chance to use up any scraps of vegetables left over at the end of the week (or even vegetable tops, ends, and peelings that you’ve stored in the freezer—think asparagus bottoms, green onion roots, broccoli stems, cilantro stems, etc). The key to making this meal kid friendly, is to chop the vegetables for serving small so that they lightly cook when the hot broth is poured into the bowl. Allow you kids to add toppings that make the dish fun like spicy sriracha, crunchy cashews, or tart lime wedges. Serve it with chopsticks (you can get training chopsticks for little ones) and let them pick up the bowl to slurp up the broth. With an endless variety of vegetable combinations, you’re sure to have a dinner that everyone will eat. Note: Traditional pho broth is simmered with whole spices including cinnamon sticks, black peppercorns, and star anise. Add them to the broth if your family prefers. In the slow cooker, place the vegetable stock, 2 TBS of Coconut Amnios, Tamari, or Low Sodium Soy Sauce, and the simmering vegetables of your choice. Cover with lid and cook on low for 6-8 hours. When ready for serving, cook the ramen noodles according to package directions. While the noodles are cooking, use tongs or a slotted spoon to remove all the vegetable pieces from the broth. To serve, place cooked noodles and chopped fresh vegetables in each bowl. Ladle over about 1 cup of the broth and top as desired with hemp hearts, sesame seeds, sriracha…whatever your little heart desires. Serves 4. Full disclosure: This blog post contains some affiliate links. Meaning, basically, if you make a purchase from any of these links it doesn’t cost you anything extra, but I may make a little money. 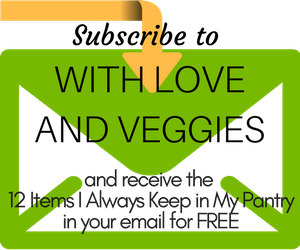 So thank you in advance for supporting With Love & Veggies. I am not sponsored by any products, brands, or vegetables featured. Thank you! I hope you try the recipe some time! I am pure veg and i like such recipe..
its my pleasure to love you..